This classic textbook in the field, now completely revised and updated, provides a bridge between theory and practice. Appropriate for the second course in Finance for MBA students and the first course in Finance for doctoral students, the text prepares students for the complex world of modern financial scholarship and practice. It presents a unified treatment of finance combining theory, empirical evidence and applications. 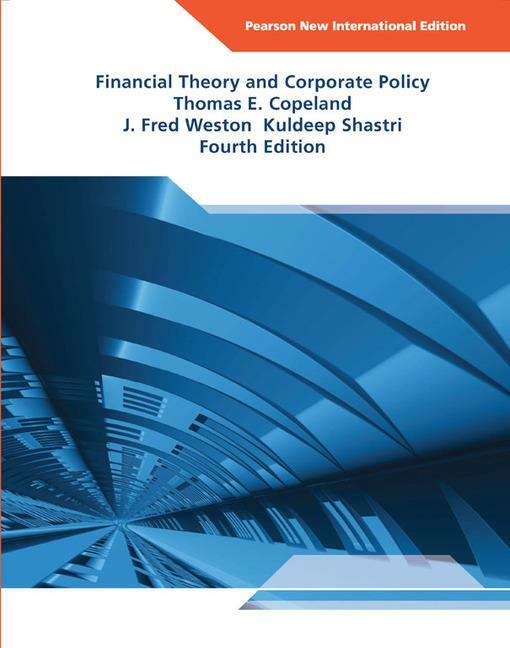 •Clear and succinct discussion of current trends and recent contributions to finance literature provides a solid foundation in established finance theory. •Emphasizes applications to help students better understand the uses of Finance theory. •End-of-chapter problems challenge students to think analytically and apply their understanding of the theory. •NEW co-author Kuldeep Shastri, renowned scholar and teacher, joins a powerful team of authors offering further depth and mathematical sophistication to this popular, well-established book. •The central paradigms of financial theory have been moved to the first 12 chapters by a reorganization of topics. •Revised chapters on capital structure and dividend policy respond to immense changes in these areas. •Chapter 7 includes new information on option pricing. •Chapter 18 provides a modern discussion of merger and acquisitions activities. •Chapter 19 explores the prevailing trends in international financial management. New chapters:•Chapter 9 includes extensive discussion of real options. •Chapter 12 surveys the theories of agency costs and signalling. •Chapter 13 discusses the role of the CFO, performance measurement, and incentive design. •Chapter 14 details discounted cash flow valuation and tax policy. 1. Introduction to Capital Markets, Consumption and Investment. 2. Investment Decisions: The Certainty Case. 3. Theory of Choice Under Uncertainty: Utility Theory. 6. Market Equilibrium: CAPM and APT. 7. Pricing Contingent Claims: Option Price Theory and Evidence. 8. Futures Contracts and Markets - Term Structure - Cox, Ingersoll, Ross. 9. Multiperiod Aspects of Financial Theory - Real Options - Investment. 10. Efficient Capital Markets: Theory. 11. Efficient Capital Market: Evidence. 12. Information Asymmetry: Agency Cost Theory and Signaling. 14. Valuation and Tax Policy. 17. Applied Issues in Corporate Finance. 19. International Finance: Theory and Evidence. 20. Open-Ended Issues for Research.